The class I'm editing is in it's own block as ".borderswap" and it's applied to the <table> with the "border-right" inline style. The class seems to be getting ignored by these two clients alltogether. Does anyone know a way around this? 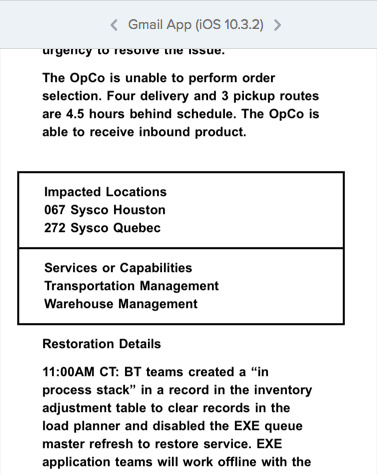 OpCo 272 Quebec (Canada Broadline) order selection is unavailable at the location. Our BT support teams are engaged with urgency to resolve the issue. 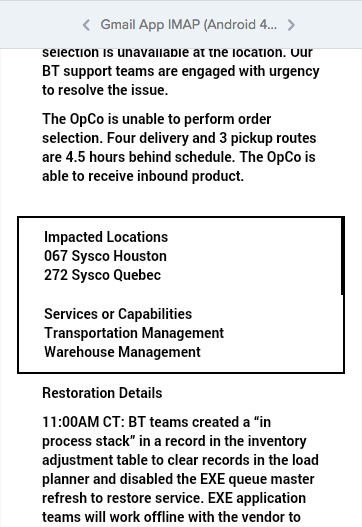 The OpCo is unable to perform order selection. 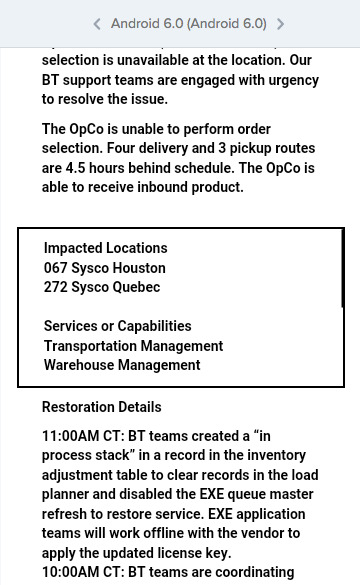 Four delivery and 3 pickup routes are 4.5 hours behind schedule. The OpCo is able to receive inbound product. 9:00AM CT: BT support teams confirmed the EXE license key has expired and are working with the vendor to generate the new license key. For questions about this notification, please contact the Command Center. However, if you need to report an issue, do not email the Command Center. Instead, create an incident with the Service Desk (281-584-1190). To update your associate communication notification preferences, click the button below.